Incubate overnight in 37°C warm water bath (overdigestion because of enzyme expiration date and restriction sites close to fragment termini, especially for the gBlock). The inaZ gene was sourced from BBa_K584027 using primers oM7628 and oM7629* (length 3.6 kbp, anneal at 58°C). The plasmid was obtained from KU Leuven (concentration unknown): PCR (Q5) ran with 10x and 1000x template dilutions, transformed into E. coli DH5a by heatshock, and plated on chloramphenicol. The inaX gene was sourced from X. campestris colonies using primers oM7626 and oM7627 (length 4.7 kbp, anneal at 70°C). Cloning overhangs were not included on these primers. The colony was suspended in 1000uL distilled water, vortexed, freezed 30 min. @ -80 deg. C, heated 20 min. @ 95 deg. C, vortexed, and debris spinned down. Before transformation of the vector, we inactivated the restriction enzymes using heat: 20 min at 80°C, and did ligation without purification. We also purified the samples on a spin column, eluted in 10 uL. For inaZ, we used BBa_K584027 as template (1/10, 1/100, and 1/1000 dilutions). Annealing temperature was 66.20°C for primer oM7628 and 61.93°C for primer oM7629* (length: 3.6 kbp). For inaX, we used X. campestris colonies as template. Annealing was done at 60.96°C for primer oM7626 and at 70.34°C for primer oM7627 (length 4.7 kbp). Conditions for Primestar HS: 1'@98C;30x(10"@98C;15"@60C;5'@68C);10'@68C (not the standard protocol). Conditions for Primestar GXL: 1'@98C;30x(10"@98C;15"@60C;5'@72C);10'@72C (not the standard protocol). Heatshock transformation of the strong expression vector made with CPEC (cf. 31/08) yielded no colonies. 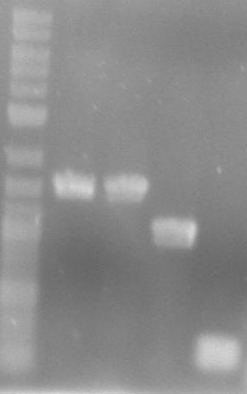 Colony PCR on the colonies with the strong expression vector made with restriction and ligation didn’t show any positive ones (cf. 31/08). 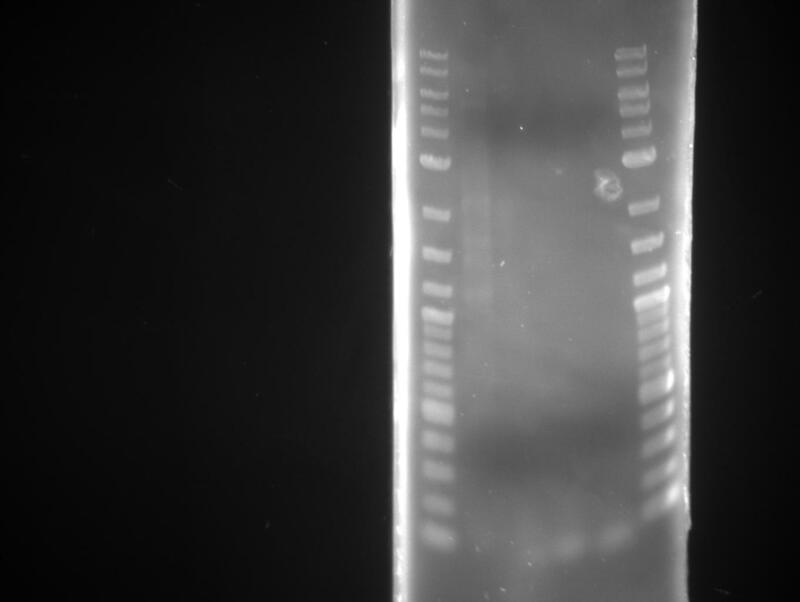 As primers, we used BioBrick verification primers (length: 534 bp). Electroshock transformation of the strong expression vector made with CPEC (cf. 31/08) into E. coli Top10 cells. We transformed our Golden Gate reactions (cf. 06/08) into E. coli Top10 cells. We tried to make inaZ Golden Gate safe by removing the internal BsaI sites. 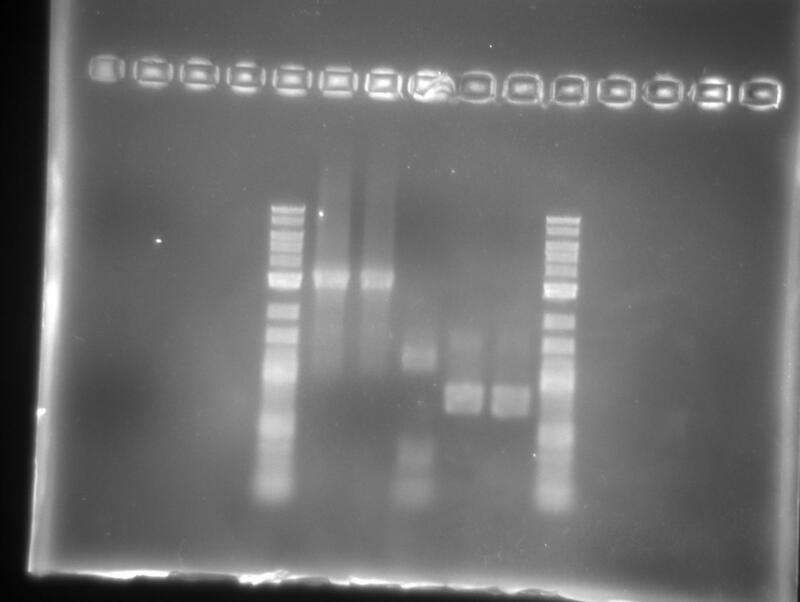 To achieve this, we used Primestar HS PCR and cut it into 3 different fragments. This was successful for the separate fragments, but we didn’t succeed to combine them. 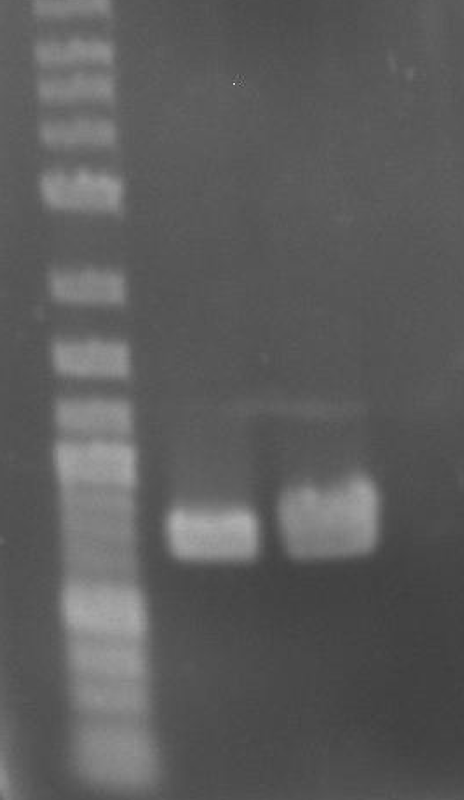 For the first fragment, this was simply from the original PCR fragment. The second fragment is a new PCR fragment, using oM7658 and oM7629 as primers and the inaZ plasmid as template (length:3039 bp). This band is smeared, probably due to excessive template concentration or annealing time. 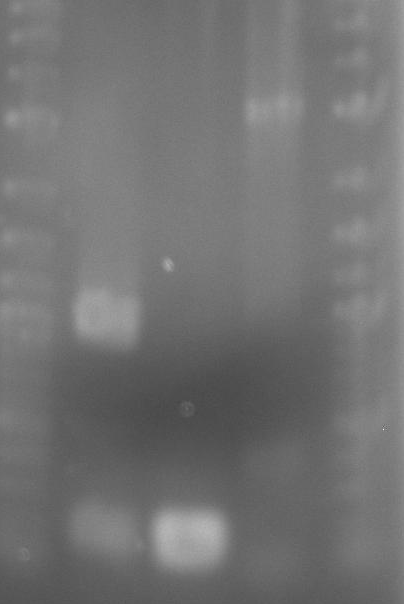 The third fragment is also a new PCR fragment, using oM7658 and oM7229 as primers and the inaZ plasmid as template (length: 293 bp). 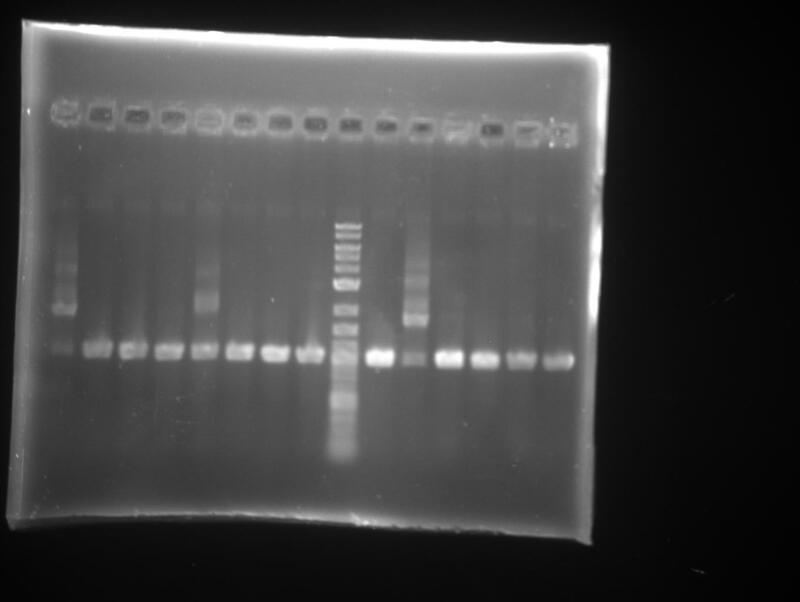 The colony PCR of E. coli cells with the constructs with the strong expression vector showed no positive colonies (cf. 06/09). Not many bands are present, and all present bands show the original vector or self ligation. 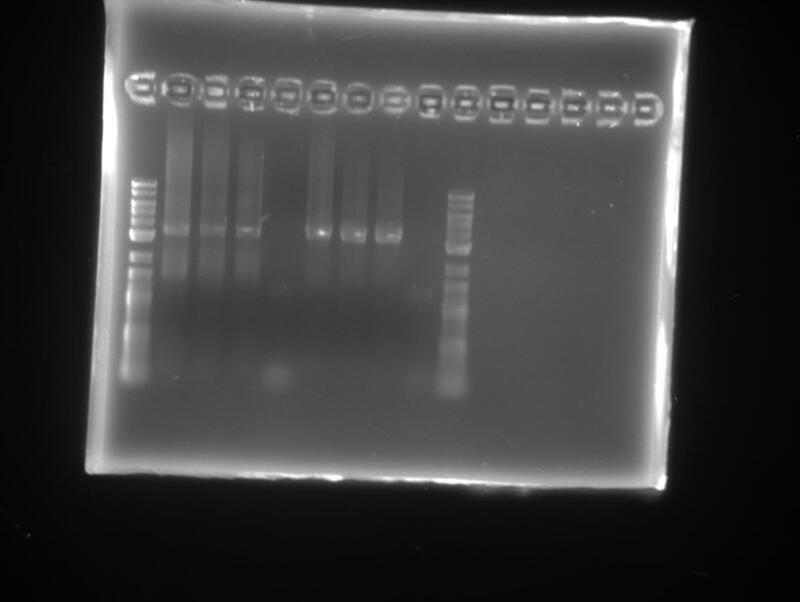 The colony PCR on our cells transformed with the weak expression vector (cf. 04/09) did show positive ones. 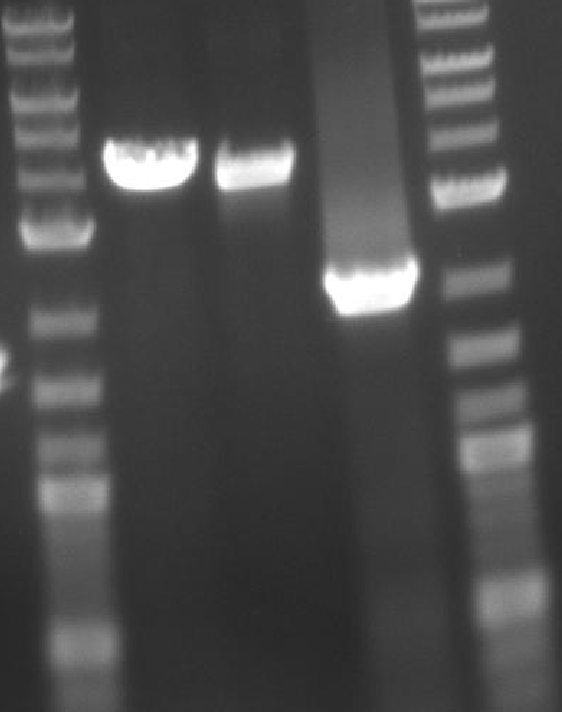 We repeated the colony PCR under different conditions, but bands were still not of the correct lengths. 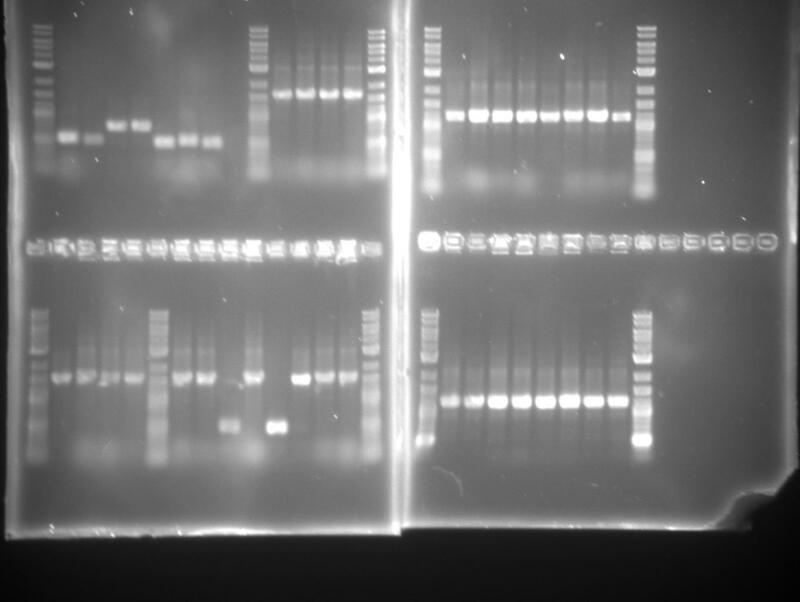 We got our sequencing results: the strong expression vector is good! 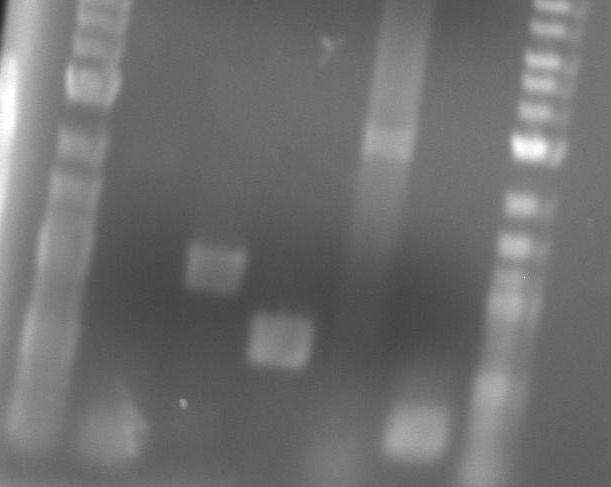 Colonies with the weak expression vector constructs are still too small to pick up with colony PCR (cf. 09/09). All our plates with the weak expression vector constructs show colonies! The control reaction has colonies as well, but much fewer, which was to be expected. Fluorescence is seen for the pXW-INP_NC-mGFPuv construct. 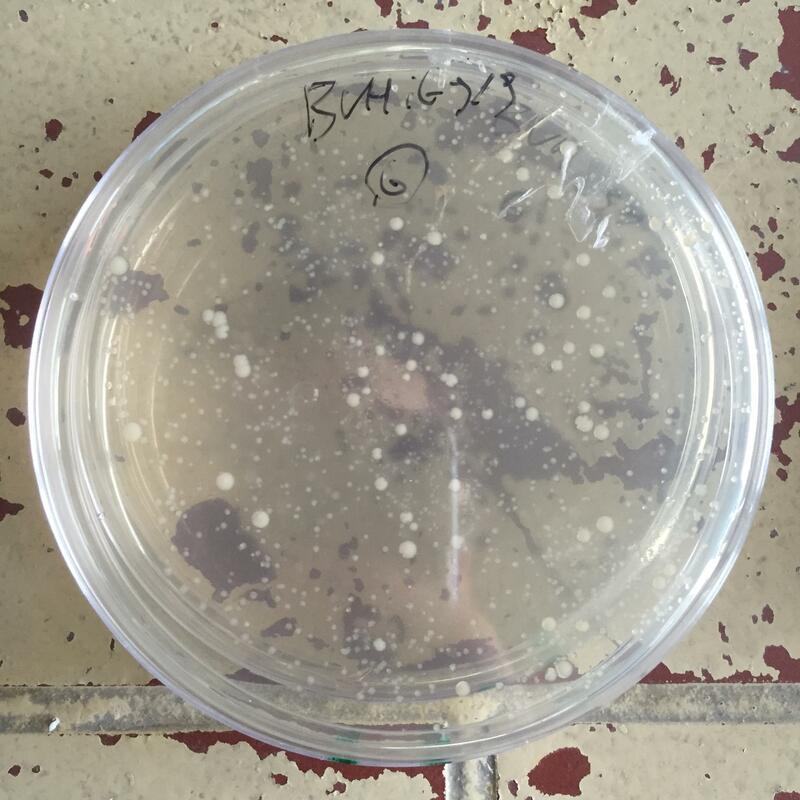 All Lpp-ompA plates have a mixed phenotype, with 10-20 large colonies (same size as control reaction), and >60 small colonies (see culture picture). Colony PCR was performed using OneTaq at 50°C annealing temperature to proof that the small colonies are the positives ones, the larger ones the negative ones. This theory was confirmed for all colonies (see gel picture). Keep incubating at 30°C to reduce copy number. pXW-Lpp-ompA-mGFPuv-(m)Strep using Lpp-ompA-mGFPuv fragment. 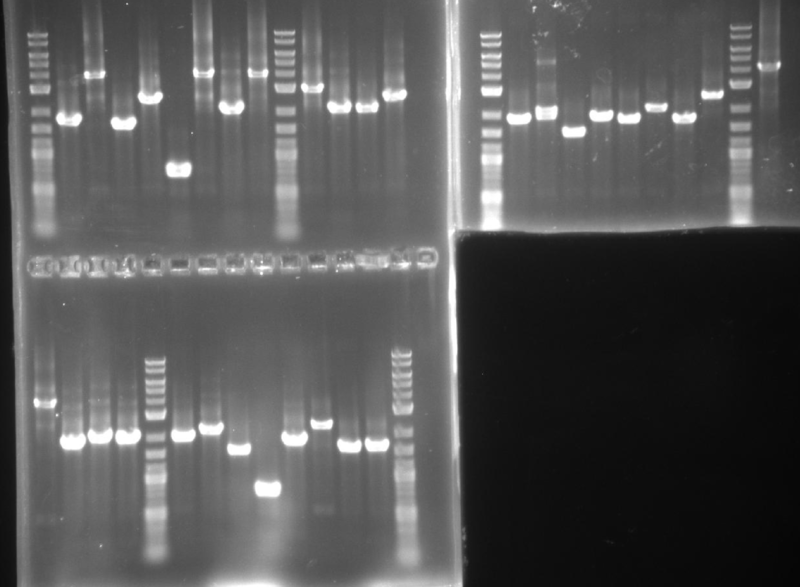 As a template, we used the Golden Gate mix for pXW-Lpp-ompA-mGFPuv, and oM7667_Lpp_Fw and oM7663_GFP_Rv-ATCT as primers (expected length:1167). pXW-mGFPuv-m(Strep) using mGFP. As a template, we used a 100x diluted gBlock, and oM7662_GFP_Fw-GATG and oM7663_GFP_Rv-ATCT as primers (expected length: 752 bp). pXS-mGFPuv using mGFP. As a template, we used a 100x diluted gBlock, and oM7662_GFP_Fw-GATG and oM7664_GFP_Rv-TACT as primers (expected length: 752 bp). 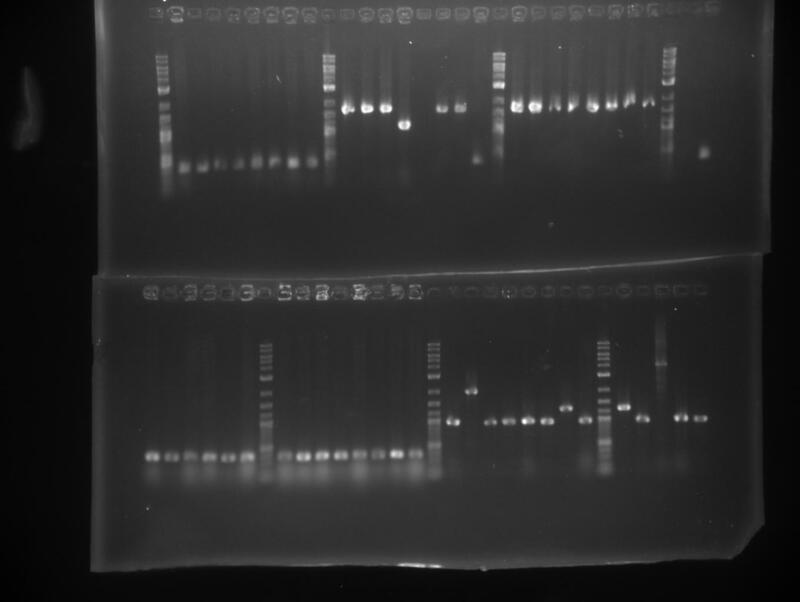 We also repeated previous PCR (cf. 08/09) of the largest piece of inaZ to make it Golden Gate safe. 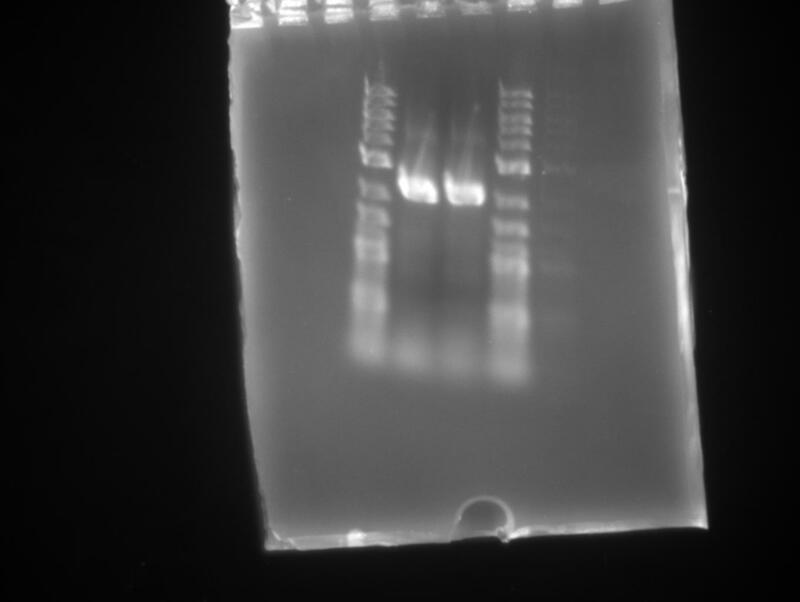 As a template, we used the inaZ plasmid, and oM7658 and oM7629 as primers (expected length: 3039 bp). Because the band was smeared last time, we should either use lower template concentrations or a shorter anneal time. 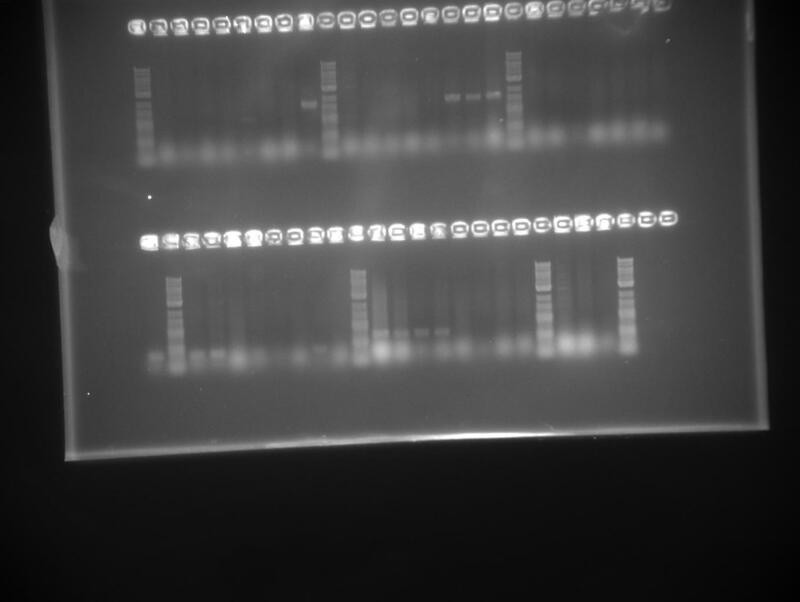 Miniprep of a number of colony PCR positive colonies (cf. 09/09). 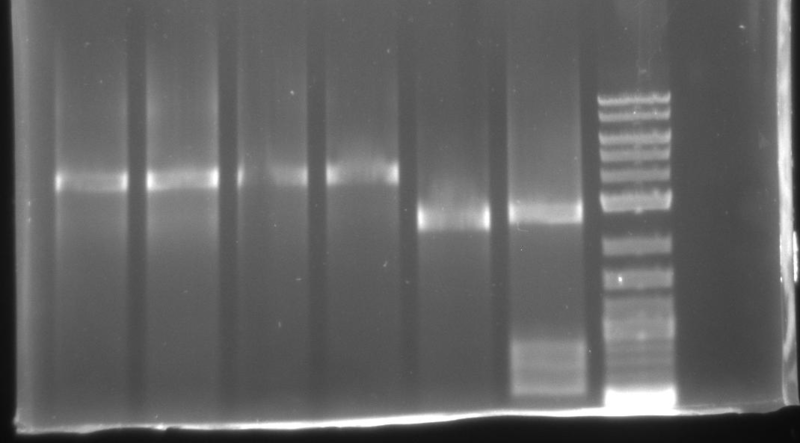 Next picture is the gel of the PCR reactions of the previous day (cf. 11/09). inaZ was run 2 times (at 1/100 and 1/1000 dilution), these are the first 2 bands. The next 3 bands are the 3 constructs. 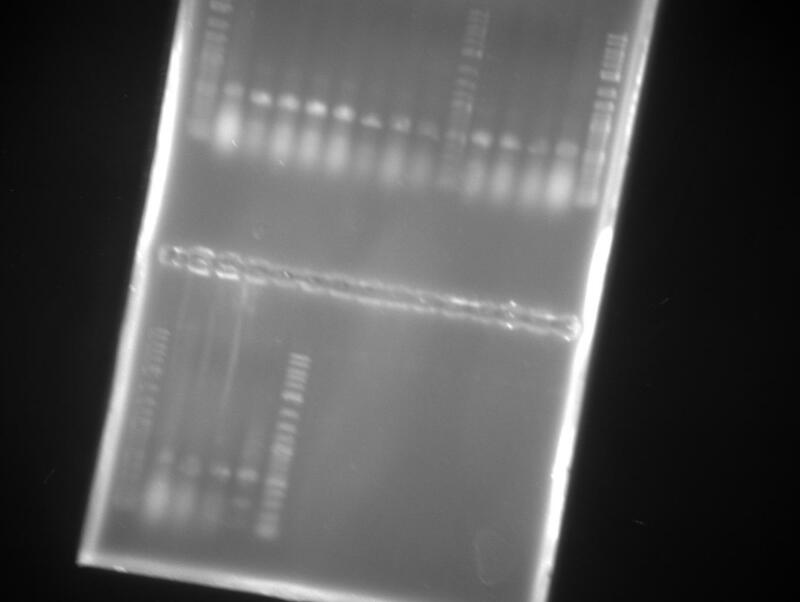 PCR using the Golden Gate mix as a template didn’t work very well (two extra bands, lane 3). We therefore repeated this reaction using a pure plasmid. pXW-Lpp-ompA-mGFPuv miniprep tubes that did not grow yesterday (cf. 12/09) did show growth today, probably through mutations. Transformed Golden Gate assemblies (cf. 12/09) into E. coli Top10 cells. 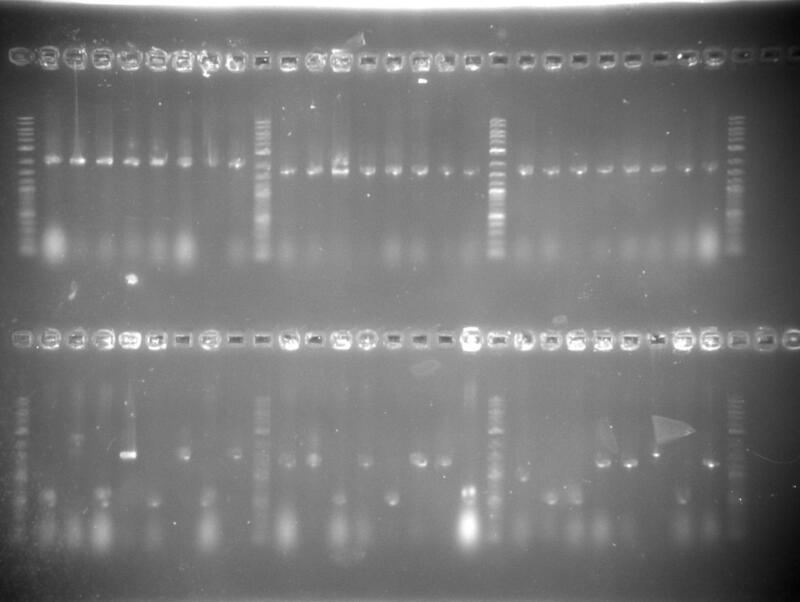 Colony PCR of the transformed Golden Gate assemblies (cf. 13/09): fail for pXW-INP_GGsafe (first 7 lanes), okay for other assemblies. For pXW-INP_GGsafe, we will make a new Golden Gate design. 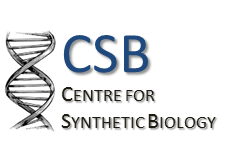 Backbone: pSB3K3 with pSB3K3 as template (plate4, F6, iGem distribution 2016), and oM7669 & oM 7670 as primers (length: 2790 bp). Insert1: INP_NC-Strep (156 ng/ul) with pXW-INP_NC-Strep as template, and oM7671 & oM 7672 as primers (length: 1684 bp). Insert2: INP_NC-mSA2 (290 ng/ul) with pXW-INP_NC-mSA2 as template and oM7671 & oM 7672 as primers. Insert3: Lpp-ompA-Strep (130 ng/ul) with pXW-Lpp-ompA-Strep as template, and oM7671 & oM 7672 as primers. Insert4: Lpp-ompA-mSA2 with pXW-Lpp-ompA-mSA2 as template, and oM7671 & oM 7672 as primers. Retry backbone: used pSB3K3 as template, and oM7675 & oM7644 as new primers (length: 2790 bp). 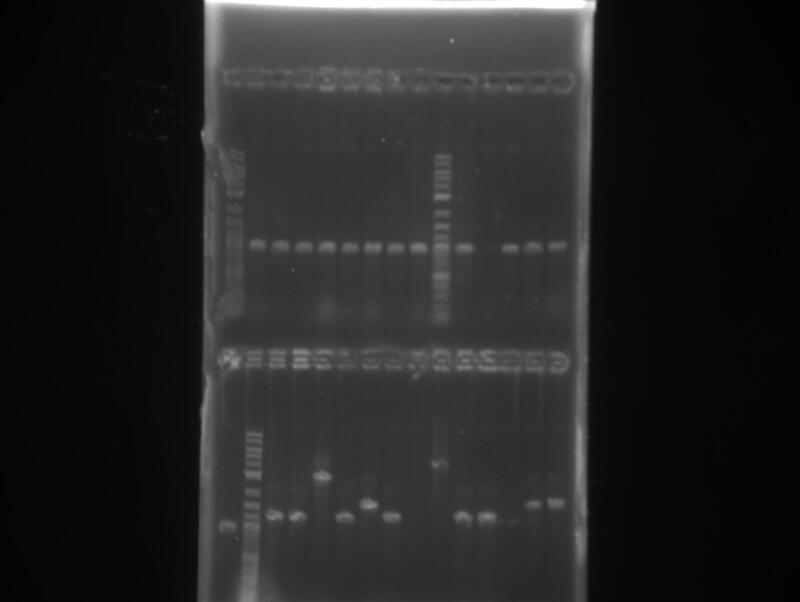 Retry insert4 (Lpp-ompA-mSA2): used Golden Gate mix as template (134 ng/ul), and oM7671 & oM7672 as primers. New parts inaZ: inaZ plasmid as template, and oM7628 & oM7673 as primers for piece1 (150 ng/ul, 634 bp), oM7658 & oM7674 as primers for piece2 (146 ng/ul, 2792 bp), and oM7659 & oM7629 as primers for piece3 (122 ng/ul, 297 bp). 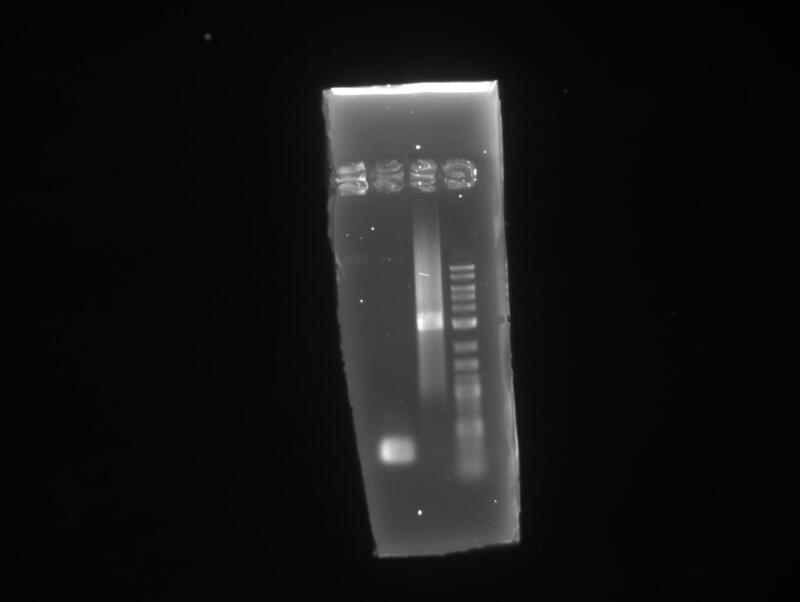 We did a colony PCR for the Golden Gate assembly of pXW-inaZ_GGsafe (cf. 19/09). Colony 2, 6, 8 are okay. We opted for a new backbone for the low copy vector (cf. 19/09): pSC101-Kan vector. We digested colony PCR samples 2, 6, 8, 13, and 32 (cf. 21/09), and a control with BsaI. If pXW-inaZ_GGsafe is indeed Golden Gate safe, it should not be cut. This was okay! Colony 2 and 6 are plasmid prepped for sequencing. Colony 13 is lane 5, control is lane 6. New Backbone "LC" (Low Copy, pSC101 ORI): pSC101-Kan vector as template, and oM7714 & oM7715 as primers (length: 4034 bp). New Lpp-ompA-Strep insert: Golden Gate mix as template, and oM7671 & oM 7672 as primers (1051 bp). 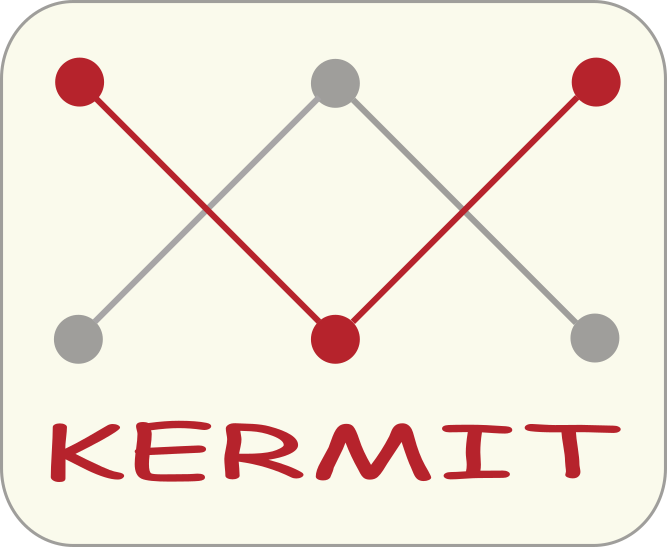 XW empty expression site: pXW as template, and oM7671 & oM7672 as primers (length: 224 bp). inaZ-RC: pXW-inaZ_GGsafe as template, and oM7665 & oM7666 as primers (length: 3100 bp). Colony PCR of all CPEC assemblies (cf. 26/09) with primers oM3441 + oM1760 for the first 5 assemblies and verification primers for the last assembly. The order of the gel is: pLC-XW-INP_NC-Strep, pLC-XW-INP_NC-mSA2, pLC-XW-Lpp-ompA-Strep, pLC-XW-Lpp-ompA-mSA2, pSB1C3-mSA2, and pLC-XW (only 3 colonies). Primestar HS PCR to create GATG-mGFPuv-ATCT, which is necessary for new attempts for the pXW-mGFPuv-Strep and pXW-mGFPuv-mSA2 constructs, due to mutations in previous versions. For this, we used primers oM7662 + oM7663, and pXS-mGFPuv as template. We also started cultures for the cell binding assay to test the attachment to our filament, and for protein extraction. For the first, we used constructs pXW-INP_NC-Strep + pSC101-RFP, pXW-INP_NC-mSA2 + pSC101-RFP, and pSC101-RFP. For the latter, we used constructs pXW-mGFPuv-mSA2 and pXW-mGFPuv. Sequenced two new colonies of construct pXW-mGFPuv-Strep (due to a mutation in GFP). Created pSB1C3-mGFPuv2 for submission to the parts registry. For this we amplified the backbone from pSB1C3 linear template using primers oM7722 and oM772 (length: 2093 bp), and mGFPuv2 from construct pXW-mGFPuv or pXS-mGFPuv using primers oM7662 and oM7664 (length: 744 bp). Golden Gate assembly was done using BsaI. For constructs pXW-inaZ-RC+Strep and pXW-inaZ-RC+GFP, more colonies need testing. New colony PCR of 2x14 colonies of constructs pXW-inaZ-RC+Strep and pXW-inaZ-RC+GFP. We found a positive colony for construct pXW-inaZ-RC+GFP (cf. 03/10). Colony PCR on 14 pSB1C3-mGFPuv2 colonies (cf. 05/10) (plates almost overgrown, assembly was apparently very efficient). 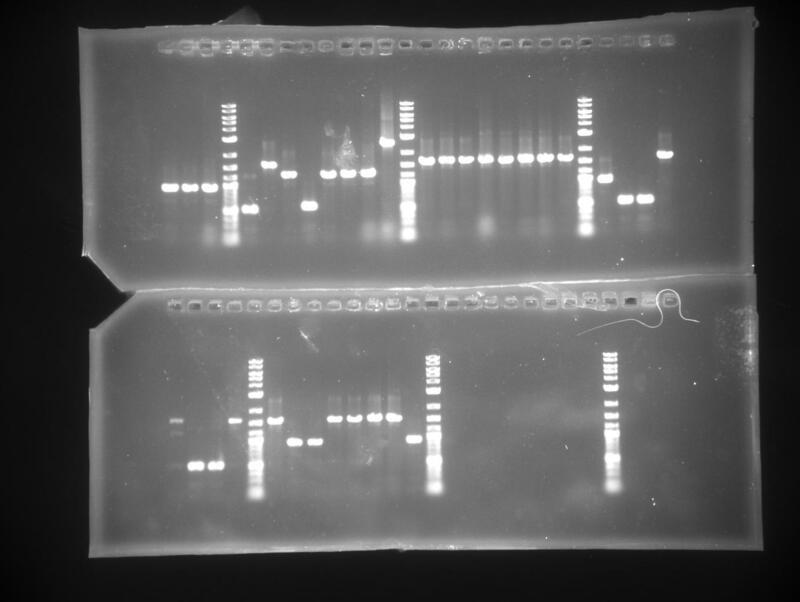 For primers, we used verification primers (length: 1030 bp). Combined pXW-INP_GGsafe with pLC-XW-INP_NC-mSA2 by electroporation (plate on kan+chloramphenicol). Sequencing results for constructs 13-24: sequencing okay for all constructs except those containing tetrameric streptavidin fusions. Point mutations were found in the coding sequence, multiple colonies showed mutations at different positions, suggesting a biological origin.